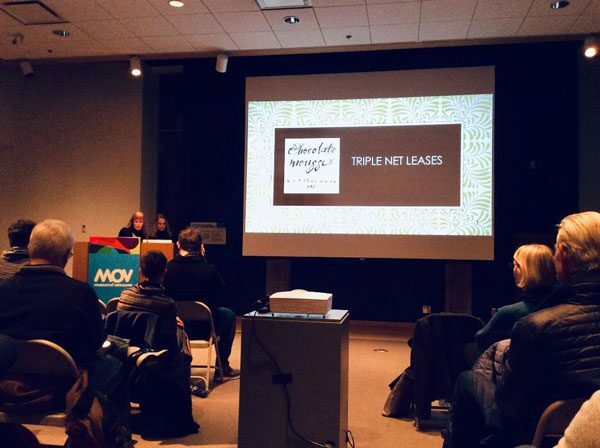 As part of their popular Built City Speaker Series, the Metro Vancouver chapter of the Royal Architectural Institute of Canada, in partnership with the Museum of Vancouver, recently hosted Triple Net Leases – Can Neighborhoods Survive Them? The highly engaging event was moderated by Gloria Venczel—Principal, Cityscape Design Inc., while presenters David Nishi-Bellingham (BC Director, AEC Property Tax), Jane and Karen Tenant (sisters/co-owners of Chocolate Mousse on Robson St.), Michelle Barile (Executive Director of the West Broadway BIA) and Marianne Amodio, principal architect at ma+hg architects Inc. shared their perspectives on the causes and solutions to Vancouver’s growing affordability crisis for small, independent businesses. Businesses close for a variety of reasons. In an interview I conducted last year focusing on Chinatown’s changing urban landscape, historian John Atkin explained one reason why small businesses discontinue is due to the generational change within family-owned businesses. Furthermore, according to an article in Forbes, less than one third of family businesses survive the transition from first to second generation ownership. But increasingly, flourishing and viable local businesses that have solid sales revenues are forced to close because of skyrocketing property taxes. Wonderbucks in East Van, 3 Vets in Chinatown, Benny’s and the Farmers Market in Kitsilano are few examples. No doubt, these are challenging times for local independently owned businesses in Vancouver. The “Triple Net Lease” is a net lease that separates out the responsibility of the operational costs of a leased building. In short, the tenant who leases a building pays its property taxes, not the owner of the building. Additionally, the tenant also pays maintenance fees and rent to the landlord. The Triple Net Lease – or NNN – becomes a triple burden cost on the tenant as business owner. This is exactly what happened to Karen and Jane Tennant, owners of West End’s Chocolate Mouse Kitchenware store. The sisters opened their kitchenware store in Vancouver’s West End in 1985 and it quickly became more than a shop. Chocolate Mouse Kitchenware was a place that provided living space for the neighbourhood: a space for the community to come together, share mutual interests and exchange stories. But between 2016 to 2019, the building’s property tax—not the rent—increased by nearly 400%, forcing the sisters to close their decade-long shop. BC Assessment’s assessed property value is based on the “highest and best use”, but because the notion of “highest and best use” only focuses on the monetary value, it doesn’t factor in community value. But ever since Jane Jacob’s Death and Life of Great American Cities, it is generally accepted that having inclusive, vibrant cities is a crucial factor to having healthy, happy neighbourhoods. Echoing Jacob’s theory on the importance of inclusivity for healthy cities, Gloria Venczel stressed the importance of vibrant streetscapes and the impact small storefronts of independent businesses have on creating this vibrancy. “Public spaces and small businesses are an important part of social resiliency. They provide a space for people to get together,” she explained with large, boxy chain stores having their genesis in malls. Local independent stores such as “Mom & Pop” shops, on the other hand, create friendly, vibrant neighbourhoods for people of different backgrounds and demographics to get together and contribute to the social connectedness in a society. Gloria advocated for pedestrian-oriented urban design that simultaneously impacts other factors, including neighbourhood walkability, social engagement that prevents social isolation as well as countering the effects of climate change, such as climate refugees. Then why is it that only monetary value is taken into account when it comes to Vancouver building tax assessments? In his presentation, property tax expert David Nishi-Beckingham shed some light into the complex property tax system in Vancouver, and the rest of Canada. Vancouver’s commercial tax rate is the second highest in Canada, after Montreal, Nishi-Beckingham explained. He also emphasized that cities need money in order to survive, and the most practical and common way to do so is through different types of taxation. There are different taxes on different property classes—from residential to supportive housing to farm—and each class pays a different tax percentage. All across Canada, David explained, municipalities depend on tax revenues in order to support their local initiatives and funding. The problem with the NNN is that the tax burden is shifted from the owner to the tenant, and for small businesses, this often becomes unviable, forcing closure. This results in empty street fronts, which has a number of consequences including higher crime rates and diminishing vibrancy, due to less foot traffic. Marianne Amodio believes it is the architect’s “principal duty to advocate for good design.” Her presentation showcased the adaptively reused Hollywood Theatre on Kitsilano’s West Broadway. Her architecture practice redesigned the art-deco building into a 6-storey multi-use building that currently under construction. Amodio emphasized the impact of design on the preservation of the existing 1935-building and streetscape that contributes to the vibrancy of the urban fabric. The new building will be used as a for-profit performing arts centre consisting of commercial and residential space. Amodio explained that, in their design process, the architecture firm “really wanted the Hollywood Theatre to come forward and shine at the street level.” One way of achieving this was by pushing back the first story along the northern side, to create a more meaningful public space. The residential entry door was placed in the middle of the northern facade, which created two smaller separate buildings. Amodio believes the smaller the space, the smaller the cost of the building will be, “it is not about what the building does, but about what a building lets people do,” she explains. For projects such as the Hollywood Theatre, the work of local Business Improvement Associations (BIA) is vital. They facilitate understanding and engagement between developer, City of Vancouver and the community. Michelle Barile, who herself grew up as the daughter of locally owned restaurant owners, acknowledged in her presentation that “communities cannot happen without small businesses. Each of these independent Mom & Pop stores has a story of ‘very, very hard work’,”she acknowledged. However, “businesses are part of our home, that become homeless” due to increased property tax assessments. The policy of “highest and best use” has caused a property assessment increase of 97% between 2015 and 2019 Barile warned. Levying shift from commercial to residential, as a 2% levy shift from commercial to residential would equate to an average of $40 per year for residents. The event finished with an open dialogue between all presenters and the audience. Some interesting questions that were asked focused on transparency, accountability and the meaning of “best use”. “Is there really any transparency in the way the municipal government in Vancouver spends the money collected on property taxes?”one member of the audience asked. Amodio replied “A civic government is our government that we as the people voted in.” As such, it is our responsibility in a democracy to make sure those who govern our city, reflect our values. Another member in the audience pointed out how small businesses, like social enterprise and non-profits, all suffer from the effects of rising property taxes and, as such, are pushed out of the city. But it is important to acknowledge the social impact of these entities to our community, not just the monetary value. Since zoning is a major cause of increased property value, a member of the audience asked why the city does not rezone the buildings into smaller buildings or rental-only zones. Venczel acknowledged that rental-only zones have a lot of merit, but in order to do so, one needs to have a lot of good reasons and a plan on how to execute it, otherwise it can cause more problems. Nishi-Beckingham added that the City of New Westminster is currently proposing rental-only bylaws and downzoning strata buildings, which has already caused a lot of controversy. Overall, the Build City Speaker Series was a well-rounded event that tackled the burning issue of rising property taxes in Vancouver from a multitude of angles, allowing stakeholders from different backgrounds to share their perspective on this topic.